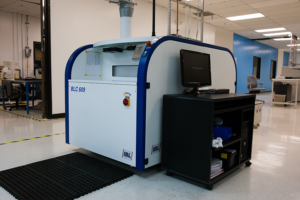 Vapor Phase (VP) reflow process continues to soar to new heights, with advancements in the overall technology of the equipment and software, creating new capabilities, reliable yields, and high quality results. With a growing demand for higher reflow temperatures for lead free soldering, miniaturization of the PCBA and the components, and an increasing mix of different thermal mass components on the same board, there has been a resurgence in the need for VP systems. VP provides optimal heat transfer capabilities, offering an excellent tool for easy and gentle reflow soldering for lead free and leaded product. When using conventional reflow systems for lead free products, the board temperature is required to rise up to 30-35°C higher than the solder’s melting point. In the VP system, this same process can be done with only 5-10°C over the melting point of the solder paste. This advantage becomes a must on ATE and other large mass boards with high density components. VP technology has evolved over time, and now there is a great deal of control on the profiles. The latest evolution of these machines offers user-controlled soldering with freely adjustable temperature gradients and profiles. It can heat large masses evenly and quickly while the peak temperature is controlled, making it a great fit for assemblies with a large variable of thermal mass components on one board. The Vapor in the VP systems, like all gases, equally fills out a given sphere. The equal temperature distribution over the boards automatically provides this physical effect, while in a convection oven, the cross profile can vary in temperature. The physical limitation of the maximum temperature in a VP system does not require further controlling mechanisms to avoid overheating. These quality features provide the highest benefits in long-term reliability of the PCBA and produces great results for lead free solder processing. Despite the great advancements in VP systems for both control and profiling, just like any other tool or technology, it requires knowledge and experience to efficiently use the equipment, know when to make the appropriate adjustments, and to yield the highest quality results. For these reasons, VP reflow processing is not widely used in the industry and not many companies can readily offer this solution. Streamline Electronics Manufacturing, Inc. (SEM) has been invested in VP technologies for many years, processing a range of complex boards through VP on a daily basis. The SEM Team is committed to the constant education and improvement in the use of this equipment to better serve our customers and the ever changing requirements they have. SEM is ready and prepared to tackle any type of board that will require Vapor Phase. Our customers can have confidence in our experience and proven track record to ensure top quality and yield every time. "Our experience with Streamline Electronics Mfg. (SEM) has been stellar. The trust, quality, and responsiveness of the team at SEM is second to none and we would not consider utilizing another contract manufacturing firm for our company's needs".